The Aga Khan Hospital in Dar es Salaam, Tanzania. 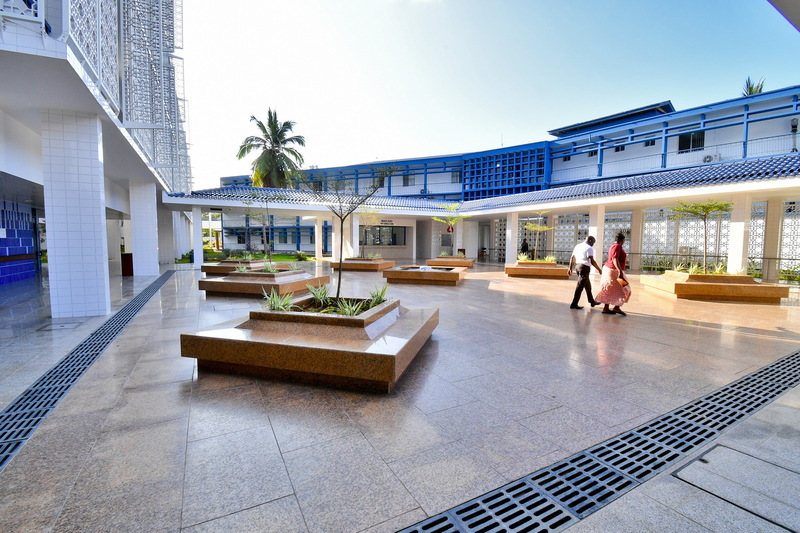 Courtyard of the Aga Khan Hospital Phase II, Dar es Salaam, Tanzania. 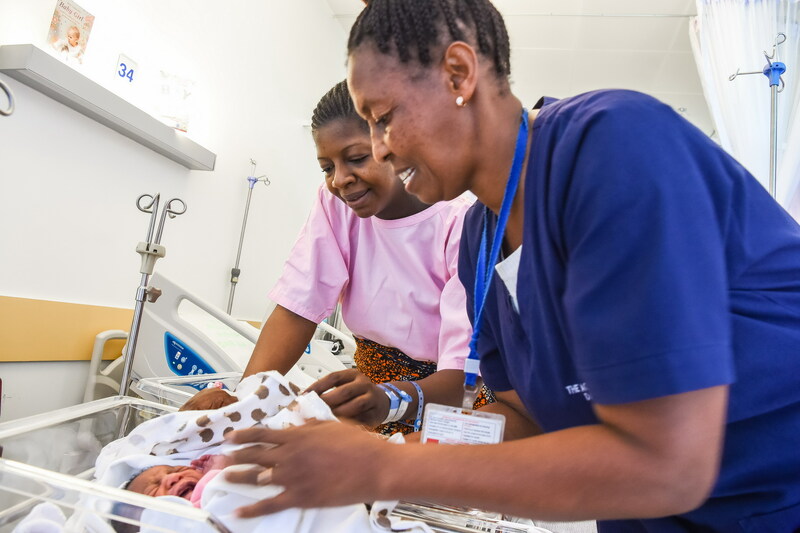 The Aga Khan Health Care Centre in Mwanza, Tanzania, provides a range of services including outpatient care and free maternal and child health services in collaboration with the Government. Providing high-quality health care and raising the health status of people in East Africa are the broad goals of the Aga Khan Development Network for the health sector. They are addressed through an emphasis, in current projects, on health systems development, strengthened by new regional programmes and investments. The Aga Khan Health Services (AKHS) has facilities in Kenya and Tanzania that provide over 700,000 patients per year with care in both rural and urban, and preventive and curative contexts. The Aga Khan Foundation (AKF) and the Aga Khan Health Services (AKHS) have been joined in their health care work in East Africa by the Aga Khan University’s Faculty of Health Sciences, particularly in the areas of health service delivery (via the Aga Khan University Hospital in Nairobi (AKUH-N), professional training - especially for nurses – community health programmes and population research. 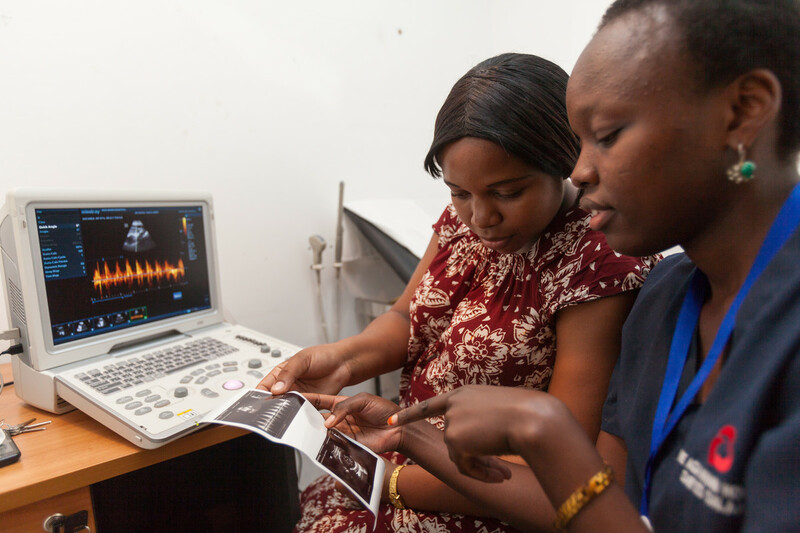 In all its endeavours, AKDN’s work in health care is based on the principle of developing an integrated health system in East Africa that aims to assist countries in building effective, sustainable health systems that are linked to services and levels of care. The Aga Khan Health Services (AKHS) operate facilities in Kenya and Tanzania that provide health care to over 700,000 patients per year. An increasingly comprehensive range of high quality clinical services, both preventive and curative, are provided by their hospitals in both rural and urban contexts. 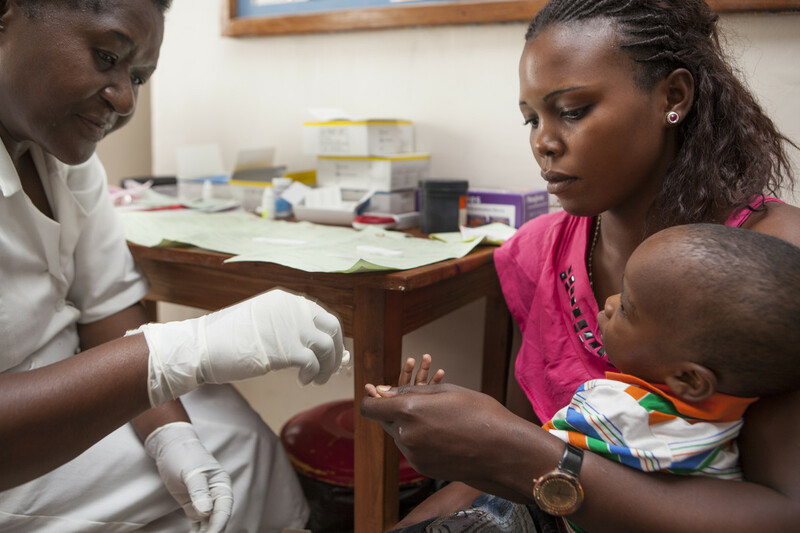 In Tanzania, AKHS works closely with various stakeholders, including the Ministry of Health, to improve the health of vulnerable population groups, especially mothers and children, and promote health services development on the national and regional levels. The Aga Khan Hospital in Dar-es-Salaam, Tanzania. The history of AKHS hospitals and health centres in East Africa begins with facilities in the cities and towns of the colonial period, including a health centre which expanded into a maternity and nursing home in Dar es Salaam in 1929, and into a hospital in 1964. It also includes maternity homes in Mombasa and Kisumu which became full-service hospitals in the 1950s; and the Aga Khan Hospital in Nairobi ( which opened in 1958 and is now one of the leading hospitals in the region (it became an Aga Khan University Hospital (AKUH-N) in 2005). These institutions entered a new period of development when Kenya and Tanganyika gained independence in the 1960s. Today, AKDN operates around 100 health centres and four hospitals in East Africa, including the leading private not-for-profit hospitals in Kenya and Tanzania It delivers high quality care, in-service training, formal health sciences education programmes, care in the community, and public health services. The corporate clientele of its hospitals has given AKDN expertise in an important and neglected area of public health in the developing world - the promotion of workers' health. Both AKUH-N and the Aga Khan Hospital in Dar es Salaam (AKH-Dar) are teaching hospitals, offering selected postgraduate medical education programmes. They have expanded in recent years, including an increase in the number of beds. The simultaneous expansion of ambulatory services and day care allows for the provision of more cost-effective care. The expansion programmes emphasise the introduction of new diagnostic services, which will improve the function of both hospitals as referral centres. For example, programmes for the development of clinical specialties, including investments in non-communicable diseases such as cardiology, oncology and traumatology, are increasing the range of secondary and tertiary services that these hospitals are able to offer their patients. 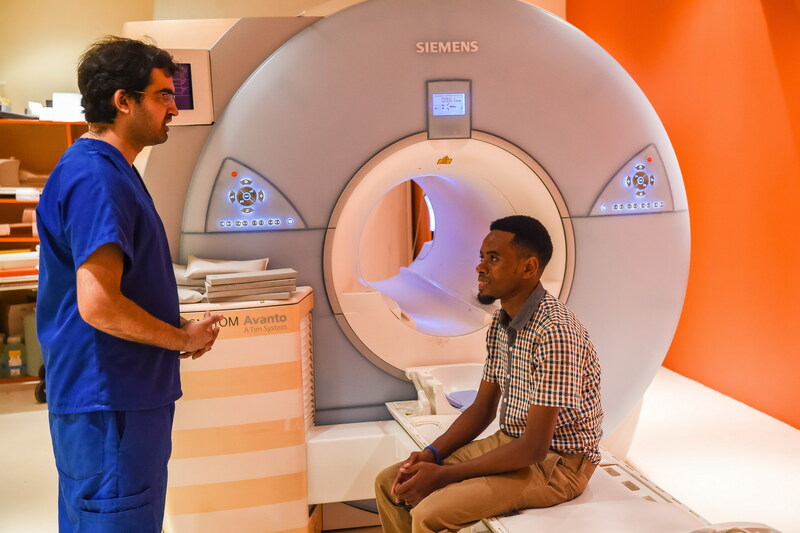 The high quality, high-technology heart and cancer programmes and the laboratory medicine and radiology services are also enhancing the capability of AKH-Dar to provide referral services in Tanzania (providing patients with the option to seek care ‘at home’ rather then in another country or region). AKUH-N, which is closely linked with the AKUH in Karachi and to other hospitals through an integrated health network in East Africa, is developing its services so that it strengthens the whole health sector in the country and the region. A young infant is being weighed at the mobile clinic set up by the AKHS project team in Kwale, Kenya. Along with this investment in hospital services, AKDN’s work in the health sector in East Africa also entails a commitment to developing effective approaches to disease prevention and health promotion. In a health system framework, care begins outside the hospital or health centre, with community-based primary health care. In the 1980s, AKHS and the Aga Khan Foundation (AKF) created primary health care projects in Kisumu and Kwale, two rural districts in Kenya. The projects have trained people in the Kisumu and Kwale communities in primary health care technologies and management, and catalysed community-based efforts to increase safe water supplies. In other projects in East Africa, AKF and AKHS are working with government services to develop tools for health sector policy design and resource allocation. AKDN’s international experience in primary health care management and information systems, acquired through its management advancement programme, is an important resource in this area. AKDN is also supporting projects that improve the health of vulnerable groups, like women, by enhancing their socio-economic status. Hospitals use any operating surpluses to subsidise the increasing cost of care, using the principle of differential pricing to create access for those who cannot afford care. Developing effective mechanisms for referral is another way of improving access. AKDN’s current hospital expansion will improve referral processes through better diagnostic services at all levels. The Community Health Department (CHD) in Mombasa works in partnership with community-based health and social organisations, Non-governmental Organisations (NGOs), and the Ministry of Health in providing support from the dispensary level through to the national level. It works to demonstrate the effective provision of primary care services through capacity building (training), the development of efficient and useful Health Management Information Systems (HMIS) at household (community-based HIS), and facilities at all levels of care. The regional health programme also includes human resource and training components for personnel from other institutions in the region, both public and private, as well as AKDN’s own facilities. AKUH-N - and increasingly Aga Khan Hospital, Dar - are becoming major regional centres for post-graduate education programmes for nurses and physicians. The Joining Hands (JH): Improving Maternal Newborn and Child Health (MNCH) Project worked to improve reproductive and maternal, newborn and child health (MNCH) in fifteen districts across five target regions in Tanzania. The Project ran from January 2012 to March 2015. The JH initiative focused on improving the quality of and access to MNCH services, increasing utilisation of MNCH services, and improving community practices and knowledge sharing and exchange on MNCH. The project also piloted innovations, such as family medicine, eHealth (mHealth and teleconsultations) and nurse-midwife franchising. The JH project was also able to contribute to MNCH knowledge sharing through participation in local, national and international fora and documentation of lessons learnt in areas such as the application of eHealth in MNCH service delivery (the use of teleconsultations), experiences of community health workers, the referral system and the use of public private partnerships in MNCH service delivery. The JH project worked closely with the Ministry of Health Reproductive and Child Health (RCH) section at central, regional and district council levels through joint planning, implementation and project performance reviews. The project also actively participated in national technical working groups, such as Safe Motherhood, mHealth working group, and gender mainstreaming working group where lessons learnt regarding project implementation were shared. JH was funded through a public-private partnership that was funded by Global Affairs Canada, (GAC) executed by the Aga Khan Foundation Canada (AKFC) and directly implemented by the Aga Khan Health Service Tanzania (AKHS-T) in collaboration with the Tanzanian Ministry of Health through a Public Private Partnership (PPP) approach. AKDN has now received a second Phase of funding from GAC for successor projects in the Western and coastal areas of Kenya, as well as the Mwanza region in Tanzania (in total 1.13m beneficiaries). AKHS's community health programmes are designed to reach vulnerable groups in society, especially childbearing women and young children, with low-cost, proven medical technologies: immunisation, systematic prenatal care, safe deliveries, and oral rehydration therapy for diarrhoeal disease. Experience within the AKDN has confirmed both the efficacy of primary health care in improving health status and its cost-effectiveness. In AKHS's approach to health services, primary health care and prevention are considered as steps towards improved health status that must be linked to the availability of high quality medical care. To complement its work in primary health care, AKHS offers curative services in institutions ranging from dispensaries through health centres to full-service hospitals. At each level of care, the AKHS focus is on providing services that are needed and wanted by the community and on building linkages within the system. It also aims to ensure a quality of care that significantly raises local standards.